Labor instability plagues longstanding regional distribution hubs like Dallas, California’s Inland Empire and Chicago, but it’s also hitting emerging markets such as Indianapolis, Central Florida and other areas where warehousing has taken off in recent years. Everywhere there is significant distribution, there are labor pool stresses. It’s one of the more unstable segments of labor. Warehouse workers will jump for small hourly wage hikes, better hours, or a different shift. They will have options for other types of jobs in the same pay range. They may simply tire of the work and opt for something different. This is the world we live in, but it’s not impossible to circumvent. If your business is built around seasonal spikes, and you must onboard temporary or seasonal help, you’ll tend to have issues getting those workers up to speed for that work. If you want a predictable outcome—such as an order picked the right way, the same way, every time—you need a predictable process. What goes in one end should come out the same, all the time every time. 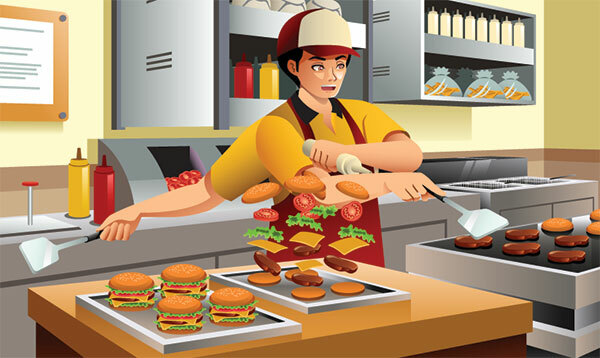 Fast food chains can quickly turn a kid on summer break into a competent employee who can make burgers, clean grills, take orders and work in the back room in a few days. For many tasks, the new worker is ready to go the same day she arrives. They work to make these various tasks modular and simple, because their customers expect consistent food—and they expect it in just a few minutes. Their labor forces are at least as fluid as those in a warehouse. Fast food companies can’t afford letdowns because a worker went across the street to wrap burritos rather than fry chicken. They have to be able to “plug & play” their workforce. So should distribution centers. Constantly-moving labor pools—like order pickers—mean that your methods should be easy to teach and easy to learn. This means standardization, simplicity and repetition of critical steps. One of the methods we recently deployed was light-directed order picking for an e-commerce distributor of children’s books with high order volumes and a rapidly-growing growing business. The technology allowed them to reduce training time to about a day, while it simplified picking. It meant that the company didn’t have to worry whether employees could even read a pick ticket, because the process became so simple. Reduces the need to read a pick ticket. This piece of the process reduces the available labor pool because tickets must be printed in the picker’s native language, or rely on his literacy. A system that eliminates reading makes you faster and more accurate—and is easy to learn. It means you can assign any particular picker to any particular zone. 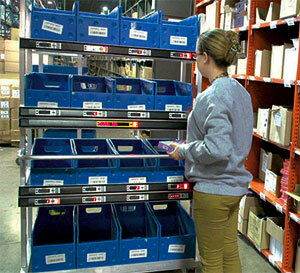 Reduces the need to learn where SKUs are stored. If the employee can see the location by pick to light, he can work anyplace, on any line, at any time. This gives you much greater flexibility to move people around, to re-slot inventory or deal with temp workers. Reduces the learning curve. Again, if you can get a picker up to speed in an afternoon, you can deal much more effectively with a fluid labor pool. Helps you identify performers faster. It’s critical to know when a new employee may or may not work out. Simpler systems help you understand that faster so you can deal with the situation as needed. When you’re faced with a fluid employee pool and a large picking operation, this kind of simplicity must be built into the process. Most distribution centers and order picking companies have significant turnover issues. Automation and process can only do so much, so you should engage in development programs, employee recognition, retention programs and other processes to stabilize your work force. You will probably never have the stability you’d like to have in this kind of business, but it’s worth improving. Some things you can do to help your people stay include incentive programs, worker development processes and other means to help people stay with you rather than jump for the first dime an hour raise. Your goal is to make it a hard decision for a good worker to leave your company for similar work down the street. Provide training: people like to be engaged in training that helps them improve and potentially move up. HR experts point to training as one of the best ways to improve your workforce while building loyalty and raising morale. Responsibility: The employee who wants to be responsible for more is exactly the type you want to retain. Solicit input: People want to work better, and allowing them to contribute to the process helps them do that. Most people enjoy having a say in how the work is done, and they will often improve the process. Information: People like to understand more about the business. Aside from a retention strategy, understanding makes people better workers. Build a professional work force: Every company has that core of people who “just get it”, and need to be nurtured to help you bring new workers up to speed. Identify these high performers and be sure to retain them. Make them your aces, your trainers, your go-to pros. This professional core can help you get new employees quickly up and running. Dealing with the fluidity of an order picking labor force is always an issue (maybe one of the central issues) for any distribution operation, but is particularly difficult in omnichannel operations where order volumes are high and demand is strong. A combination of automation, HR processes and internal training can help you overcome these issues. Just like a fast-food company, you should be able to get workers to speed quickly—and replace them as quickly, if needed.